Tasks in Progress window displays the list and the status of Tasks which will be or have been executed within a 2 hours window. 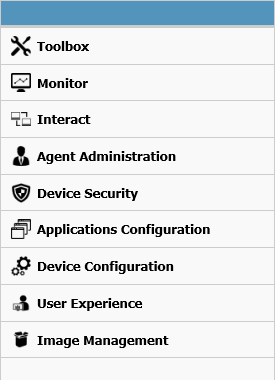 For complete overview of Tasks, Administrator shall use the Tasks and Commands Board section. The task progress legend (shown on the right in the picture above) shows the progress of a selected task, allowing realtime monitoring of tasks sent to managed devices. All instances of Xcalibur W Agent are bi-directional and report the progress of any task that has been sent to them. The task progress list shows each individual task that has been sent down to the various devices and indicates the current status of each task. See the Publishing Tasks section for details about the various statuses shown in the legend. 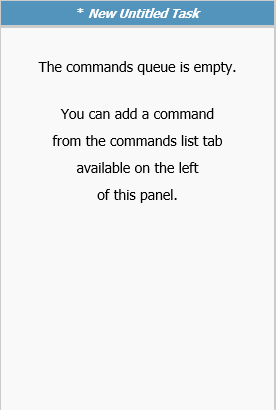 This section consists of two vertical tabs that allow commands to be configured and added to the Command Queue. For more details, see the Tasks and Creating Tasks section.